Villa Antonia is a beautiful four bedroom villa which is set on the hillside just 5 minutes drive from the nearest beach, Cala Salada in San Antonio, Ibiza. 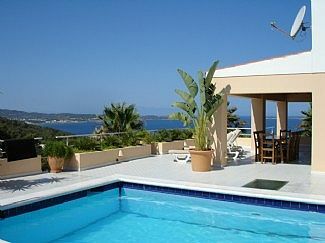 Therefore the villa enjoys amazing sea views. The private swimming pool is surrounded by a spacious sun terrace with sun loungers. A covered terrace is provided with patio table and chairs and a built-in barbeque which is ideal for alfresco dining. The villa enjoys air conditioning throughout and is laid out over 2 levels. On the ground floor the lounge includes satellite TV with English channels. The kitchen is well equipped including a dishwasher. The master bedroom is also on this floor which has a double bed and ensuite bathroom. On the lower floor there are 2 further bedrooms with twin beds and a separate self-contained apartment with its own entrance. This apartment has 2 single beds and an extra mattress for a 9th person. Cleaning twice a week, towels and linen provided. Air conditioning fitted throughout the villa. on ground floor open plan lounge/diner has a comfy sofa, sat TV, DVD and large dining table easily seating 8. Sliding doors lead to large sun terrace with spectacular sea views. on ground floor with fridge/freezer, oven, hob, microwave, dishwasher, kettle and toaster. All crockery and glassware are provided.